A floor-to-ceiling renovation brings light, function, openness and an East Coast contemporary sensibility to a young family's outdated Chesterfield kitchen. 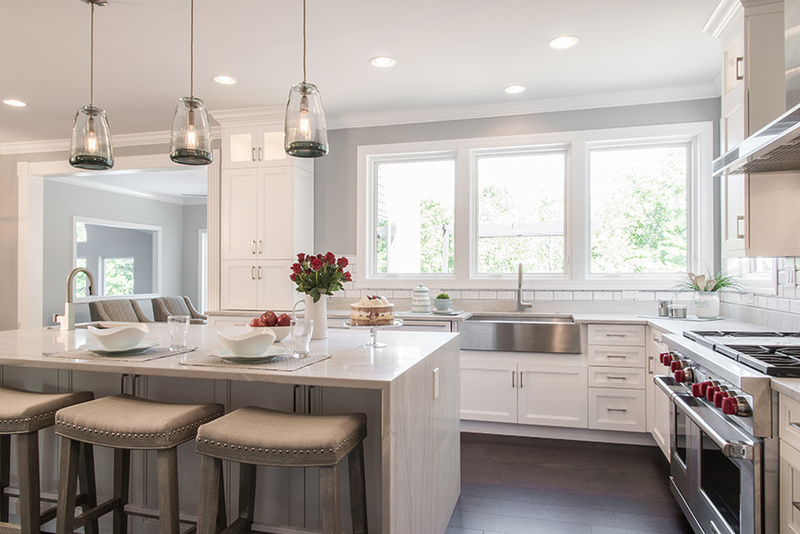 With a toddler in tow and a penchant for the contemporary look of their East Coast roots, Kristin Santi and Matthew Diddy wanted a clean, bright and well-functioning kitchen in their Chesterfield home. Dana Dunbar of Lorrien Homes, the general contractor who spearheaded the young couple’s renovation, says the space felt slightly claustrophobic thanks to dim colors and its lack of light, natural and otherwise. “It was a very traditional look: dark paint colors, dark cabinet colors, only two windows in the corner over the sink. They came from Manhattan and were used to a contemporary look, so they wanted more light and cleaner lines,” says Dunbar. So, Dunbar focused on a configuration and colors that would open up the room both visually and in terms of functional storage and appliances. 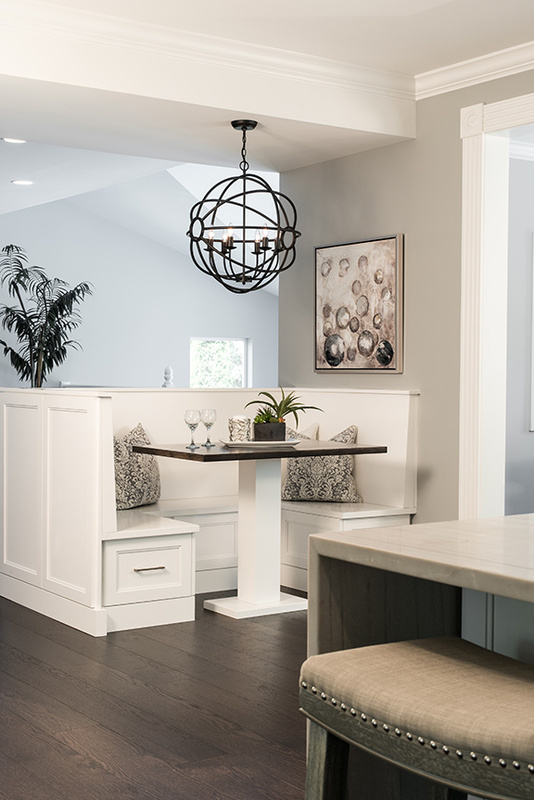 Neutral yet anything but bland, soft gray tones such as Monorail Silver and Gray Screen from Sherwin Williams enhanced the natural light. The pair of tiny corner windows became a larger bank of windows that dominate the wall over the sink, which he repositioned from the corner to the long end of the countertop. 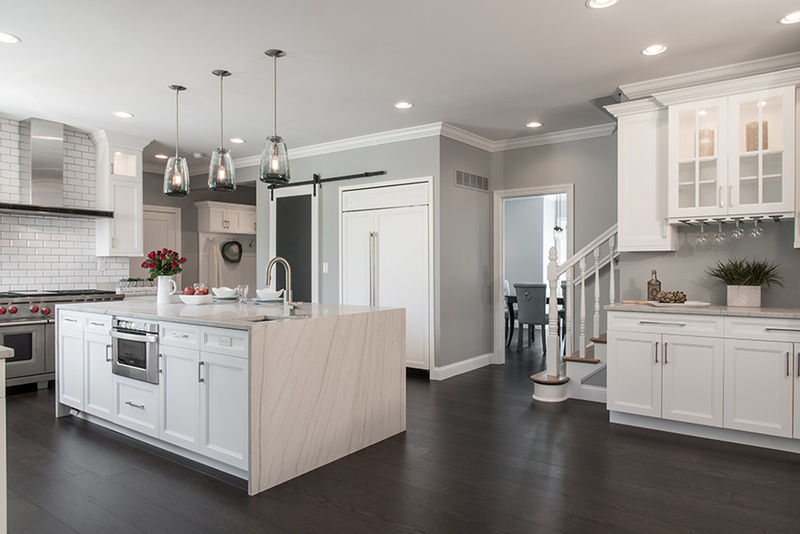 The couple chose classic white shaker cabinets, not only to allow maximum light to enter the room but for simple lines that look clean and collect little dust. In fact, there are relatively few wall cabinets, apart from unobtrusive upper units near the entry to the garage. For 3-year-old Miles, the full-sized chalkboard barn door in front of the pantry—one of Dunbar’s favorite features of the redesign—offers a welcome place to draw while the adults prepare dinner. An infusion of high-end kitchen appliances would stir envy in even professional chefs, starting with that impressive 48-inch Sub-Zero refrigerator, artfully residing behind a set of white cabinet doors that match the rest of the room. Cater-cornered to it is the six-burner Wolf range, which faces a large center island with gorgeous, white waterfall granite. But, many of the most functional aspects of the kitchen are the features a visitor might not readily see: an “electronics garage” with USB charging ports, neatly tucked away into multipurpose cubbyholes; a touchless faucet; the microwave built into the island; and the custom-built walk-in pantry that sits just behind that spectacular barn door. “Originally, it wasn’t going to be a walk-in pantry; it was just going to be like a cabinet,” Kristin says. “But we talked to Dana every day and drew what we imagined it would look like. While the carpenter was there, we made changes along the way to make sure it was what we wanted.” Like everything else in the kitchen, the pantry is tailored to fit all the very specific purposes for which the family would be using it. Every jar, can, canister, basket and box has its place.